This recipe is by Matt B., a professional market researcher in Seattle, and an amateur at everything else. He cooks because he loves food, science, and challenges, so send him recipe requests anytime! One afternoon, my roommate came home cradling a large leg of lamb, clumsily dropped it on the counter and asked me what I could do with only it and what was left in the fridge (hence the recipe calling for leftover mashed potatoes). Two days later, it became this gnocchi dish and its accompanying grave-like silence at the table, followed by discrete plate-licking (mostly by the Jack Russel) and food comas. There's some prep work involved, but trust me, you can taste the love in every bite. If you would like more information about the modernist techniques, ingredients, and equipment used in the Sous Vide Leg of Lamb with Gnocchi you can check out the following. Salt the lamb leg with kosher salt--all legs are different, but mine was about four pounds. OPTIONAL BUT HIGHLY RECOMMENDED: trim the lamb of excess fat, and render over medium low heat (caution: will attract Jack Russell Terriers). Sprinkle the meat with the dry parsley, black pepper, and half a teaspoon of garlic powder. Seal with 1/4 cup rendered lamb fat OR olive oil, and cook in an immersion circulator for at least 48 hours and no more than 60 hours at 135°F (57.2°C). When the sous vide leg of lamb is done (after 24 hours it will be tender-enough to pull the bone out with your fingers if you like), reserve the liquid from the bag for the sauce later (a boneless 3-pound raw cut netted me 1 cup of liquid). You will have lost at least 1.5 ounces of water weight per pound from the meat (boneless). Reserve a pound for leftovers. Chop the remaining leg into 1-inch pieces. Mix three cups of mashed potatoes with the egg and flour. Bring a pot of salted water to boil. Separate the mashed potato mixture into large handfuls and roll out into 3/4 inch diameter ropes. Cut into one-inch pieces, and boil in no more than quarter-pound batches until they float (approximately one minute), then remove to a colander and then to an oiled sheet pan. DO NOT OVER-BOIL, they'll get waterlogged and turn to mush. Roughly chop the mushrooms and saute them in a 12-inch skillet over medium-high with two tablespoons of rendered lamb fat and a heavy pinch of kosher salt until they've lost half of their volume and have taken color. Add two tablespoons of the rendered fat to the pan with a 1/4 cup of AP flour, mix thoroughly to remove the lumps, and cook over medium for three to five minutes, adding the reserved lamb liquid plus stock or broth, and red wine gradually. Add marjoram leaf and black pepper and taste for seasoning. Preheat the oven to 450 F. Mix the trimmed asparagus with a tablespoon of vegetable oil and two heavy pinches of kosher salt and spread onto a half sheet pan. Roast the asparagus for 20 minutes, turning them halfway through. Chop into one-inch pieces, and add to the sauce with the mushrooms. Stir in the sous vide leg of lamb pieces. When it's time to serve, saute the gnocchi in two-serving batches over medium-high with 1 teaspoon of olive oil per batch until lightly browned. Top with the sous vide lamb, asparagus, and mushroom sauce. Garnish with fresh parsley or Parmesan cheese. 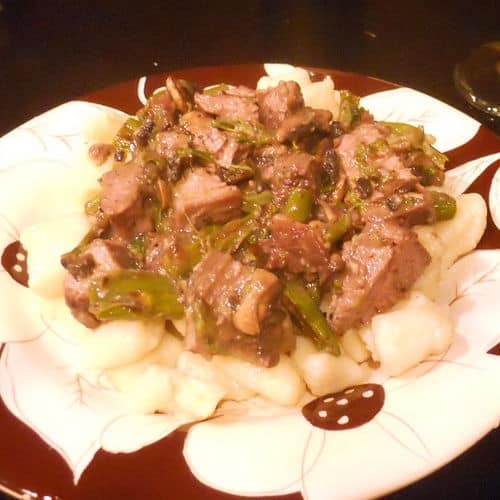 This recipe is for sous vide leg of lamb with asparagus and mushrooms over homemade gnocchi.